When you're writing business and employment letters, the format of your letter is important regardless of what type of correspondence you are sending. Your letters and emails need to be appropriately addressed, formatted, written, and spaced. If you have a contact person that you are writing to, the letter should be addressed to him or her. Your letters need a professional greeting and closing. Each paragraph of your letter should be focused and include detailed information on why you are writing. In the final paragraph of your letter, thank the person you are writing to for considering your request. Don't forget to include your contact information: full name, address, phone number, and email address - so it's easy for the reader to connect with you. Here are sample professional letter and email formats including cover letters, business letters, resignation letters, reference letters, thank you letters, and letters for a variety of other employment-related scenarios. When writing a business letter, keep it simple and focused, so the purpose of your letter is clear. Use the first paragraph to introduce yourself. The second and third paragraphs will explain why you are writing and what you are requesting from the reader. End your letter by thanking the reader for considering your request. Keep your letter short. Two or three paragraphs and a single page is sufficient, leaving room for your signature at the bottom of the letter. Choose a simple font like Times New Roman, Arial, or Calibri. A 12 point font size is easy to read. Single space your letter, leave a space between each paragraph and before and after the contact information and closing. Left justify your letter. Review a sample formatted business letter, and download the free template to use as a starting point for your own correspondence. When you're sending emails to apply for jobs, for work, or for business purposes, it's important to format each section of your message correctly. It's easy, for example, for emails to get lost in an inbox if they don't have a subject line, or to not get a second glance if they have typos or other errors. Subject Line - This should explain why you are writing in a few words. Salutation - Start the email with a professional greeting. The body of the Message - Explain why you are writing as briefly as possible. 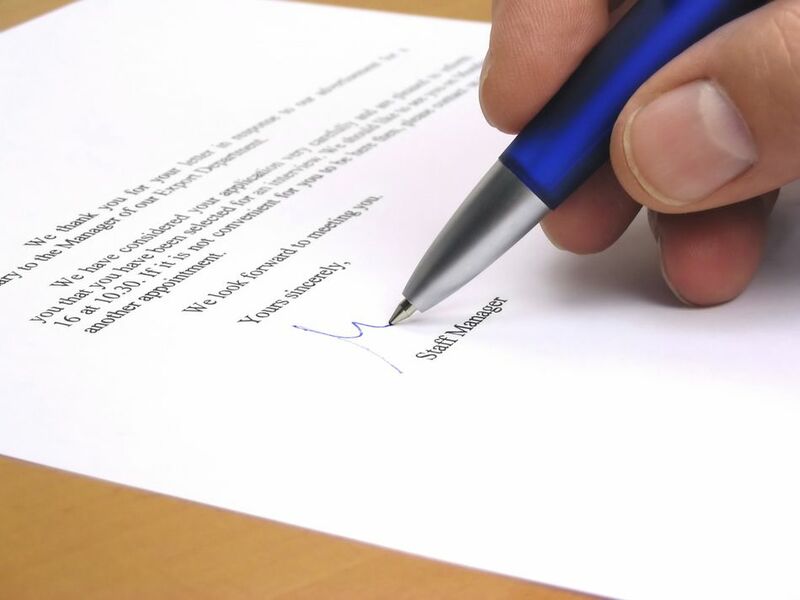 Closing - End your message with a professional closing just as you would a business letter. Signature - Your signature provides information for the reader to get back in touch with you. Include your full name, email address, phone number, and your address if you are expecting a written reply. Write your email messages as you would any other business correspondence, with full sentences, paragraphs, and a space between each paragraph. The key to writing and formatting email message is to keep them short. Most people don't read beyond the first or second paragraph, so make your point at the beginning of your message. Review examples of professional email messages to use to correctly format your own messages. Include information on the job you are applying for, why you are a good fit for the position, and how you will follow up. Take the time to match your qualifications to the job. Use your closing paragraph to thank the employer for their consideration. Be sure to include spaces between paragraphs and an appropriate greeting and closing. Left justify your letter and use a simple font like Arial, Verdana, or Times New Roman. Review a sample formatted cover letter, and download a free template to use to write your own cover letters for jobs. The first paragraph of the letter should include your thanks and appreciation for the opportunity. Next, mention that you are accepting the offer. State the terms of employment including the salary, benefits, and anything else you have negotiated with the employer. The last paragraph of the letter or email confirms your start date. You can also mention that you are looking forward to starting work. If you are accepting a job via email, list your name and contact information after the closing. Review sample job acceptance letters, and download a free template to create your own letter. A letter of interest, also known as a prospecting letter or inquiry letter, is sent to companies that may be hiring but haven't listed a specific job opening to apply for. Your first paragraph should mention what you have to offer the company. Explain why you would be an excellent new hire. The second and third paragraphs should provide examples of how you have used your strengths in prior roles. The last paragraph of the letter should include a request to meet with the company to discuss employment opportunities. Be sure to include your contact information in your signature (email address, phone, mailing address) if you are sending an email message, so it's easy for the reader to get in touch with you. For a printed letter, include your full name and sign above it. Send a copy of your resume with your letter of interest so the employer can review your complete work history, educational background, and qualifications. Review examples of professionally written letters of interest, and download a free template to use to create your own correspondence. A reference letter should provide information on who you are, your connection with the person you are recommending, why they are qualified, and the specific skills they have. The first paragraph of the reference letter describes how you know the person you are recommending and why you are qualified to provide a recommendation. The second and third paragraphs of the letter provide information on why the person is qualified for a job or graduate school, what they can offer, and why you are endorsing them. The next paragraph should state that you "highly recommend" or "strongly recommend" the individual. The final paragraph contains an offer to provide more information. Include an email address and a phone number within the paragraph. Also, include your phone number and email address in the return address section of your letter or your signature if you are sending an email reference. Review examples of professionally written reference letters, and download a free template to use to write your own recommendations. The format of a resignation letter should be brief and factual. You don't need to include any more information other than the fact that you are resigning and the date your resignation will be effective. Optional, but not required, information that you can include in a resignation letter is your appreciation for the opportunities you had, a reason for leaving, and an offer to help as you transition out of your job. The first paragraph of your letter should say that you are resigning and include your last day of work. Optionally, you can another paragraph thanking the company for the opportunities they provided while you worked there. Also optional is an offer to help with the transition. Review resignation letter samples, and download a free template to use to write your own letter of resignation. When you write a thank you letter after a job interview, as well as saying thanks for the interview, it's a good idea to restate why you are interested in the job, what your qualifications are, how you might make significant contributions, and why you are qualified for the position. Your letter should be formatted as follows for a mailed letter. If you're emailing your thank you, list your name and "thank you" in the subject line of the message. Start your letter by thanking the interviewer for the time they spent interviewing you. In the next paragraph, mention the specific qualifications that make you a strong candidate for the job. If there was anything you wished you had said at the interview, but didn't, use the third paragraph to mention. Conclude your letter by reiterating your thanks and stating that you are looking forward to hearing from the hiring manager. Review examples of formatted thank you letters and emails, and download a free template to use to write your own correspondence.